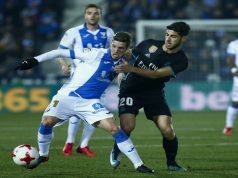 Cristiano Ronaldo hit three as Real Madrid cruised past Espanyol on Sunday night, in their third consecutive goal fest at the Santiago Bernabeu. 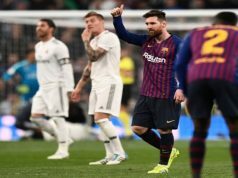 Los Blancos moved to within four points of leaders Barcelona thanks to a hat-trick from the Portuguese and goals from Karim Benzema, James Rodriguez, and an own goal from Duarte. Unlike last week against Real Betis, Zinedine Zidane men were focused from the start. After just seven minutes, Real took the lead as Benzema headed a James cross into the bottom corner. Four minutes later, Enzo Roco brought Ronaldo down inside the box and the referee pointed the spot. The Portuguese cooly converted to make it 2-0 for Los Merengues. The game seemed over after 16 minutes, when James Rodriguez scored the third goal for the hosts. The Colombia international sent a powerful strike that deflected of Diop and found the back of the net. Espanyol had a good chance to shorten Real’s lead right before the break, but Keylor Navas brilliantly denied Salva Sevilla. 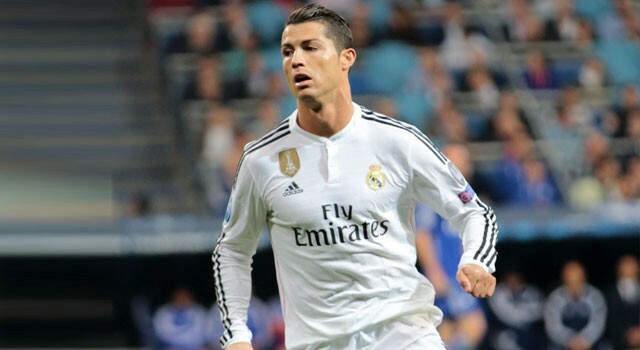 In the next play, Ronaldo made it 4-0 after dribbling past two defenders and smashing one into the far corner. 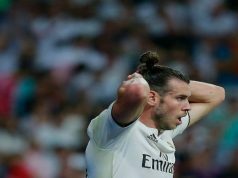 The second half was pretty relaxed for Los Blancos, and Zidane even allowed himself to make changes and rest some of his key players, like Luka Modric, Toni Kroos and Karim Benzema. Ronaldo completed his hat-trick with ten minutes to go as he headed a cross from Jese Rodriguez into the back of the net. A couple of minutes later, Real had their sixth as Oscar Duarte turned another Jese cross into his own net.